I came across these following strategies mentioned in a dissertation while browsing and hope this would help my readers. once in fifteen days helped to get 680 kg of paddy per acre. control yellow leaf disease of areca. neem leaves, pulse plants and mulch crops such as red gram, horse gram and groundnut. Growing intercrops such as coriander, garlic and onion controlled many insects and diseases. Baphna (1992) reported that with the use of organic fertilizers such as oil cakes and mulches, the sapota plantation which was very weak due to the use of chemical fertilizers and pesticides, became healthier. Gupta (1992) reported the results of experiments conducted by Gangopadhyay and Das on the bacterial leaf blight of rice. Cow dung slurry was found effective in reducing the disease incidence to 20-37 per cent when stale cow dung was used. Disease incidence of only 4.5 per cent was observed when fresh cow dung was used. Bhaskar and Ashok (1993) found that application of cow dung, poultry manure, home and town compost maintained soil fertility. Weeds were not uprooted as they protected the moisture in the soil by preventing strong sunlight to fall on soil and when decomposed it became additional manure. They reported that pests like spiders, red ants, some birds, etc., did not harm the plants but acted as predators for harmful pests and rodents. Budathoki (1993) examined that the application of cattle urine in the form of top dressing was a traditional practice used by farmers in Nepal to manure vegetable crops. The diluted solution (1:1) of fresh (preferably 7-10 days old) animal urine was applied at the Rate of 50 ml per plant which was found to be as good as urea or ammonium sulphate application. Balasubramanian et al. (1995) identified that farmers followed cow dung coating for cotton seeds, soaking sorghum seeds in cow urine, soaking Bengal gram seeds in water and soaking sorghum seeds common salt water. Regarding plant protection measures, cow dung cake was used as burrow fumigant, displaying crow’s carcass for scaring birds and beating empty iron drums to ward off birds. Gothi (1996) reported the effect of buttermilk on some crops. Buttermilk sprayed on twenty five day old rain fed crop of groundnut resulted in the higher yield of pods and fodder compared to the control. On cotton and sesame crops, it helped to survive the water stress period of 47 days caused by delayed rains. Ramesh et al. (2007) reported that farmers used FYM as the predominant source of organic manure followed by Narayan Devaraj Pandey (NADEP) compost, biogas slurry, green manure and cow horn manure, bone meal, poultry manure, neem cake and karanjee cake were used as manures from off-farm resources. Spraying of neem oil (32.6%), cow urine (18.4%), and fermented butter milk (16.3%) were the most frequently used methods of pest control by organic farmers. Rajak (1993) delineated the dysfunctional consequences of pesticide usage such as development of resistance in pests to pesticides, resurgence of pests, elevation in the status of minor pests, harmful pesticides residues, undesirable effects on non target species’, general environmental pollution and ecological imbalance. Most of my schooling was done in Air Force schools (which later became Kendriya Vidyalayas) and so we were used to vast open spaces. We played cricket and gulli-danda in fields which were twice the size of Mumbai’s Brabourne Stadium. We never faced the ire of neighbours complaining of broken glass windows. The houses stood at the dge of the fields and very far from where we indulged ourselves in games like ped-ka-bandar , kho-kho etc. We trudged to our school through open fields, thick with vegetation. During summers we often came across remains of snake skins which we rarely touched. Rains were the times, when we often slipped and soiled our uniforms. This was in the seventies. I don’t know whether the present-day Cantonments have so much open spaces, as was the case in our times. We familiarized ourselves with the names of fruit trees and flowering plants during our walks. Each would come up with the name in his/her mother tongue. Some of which were really tongue twisters, and had a good laugh at their expense. At times we would try to unravel the mysteries behind those names. Some plants, we were told were friendly and some to stay away from. One such plant was Akk (Caliotropis) which we knew as milkweed. Once you struck the branch or the leaves a milky white emerged from it. The milky white liquid is harmful for the eyes, my father had instructed me. Being kids we were curious and didn’t strike the plant with our hands but used a stick to strike a blow and enjoyed seeing the milky white liquid flowing to the ground. 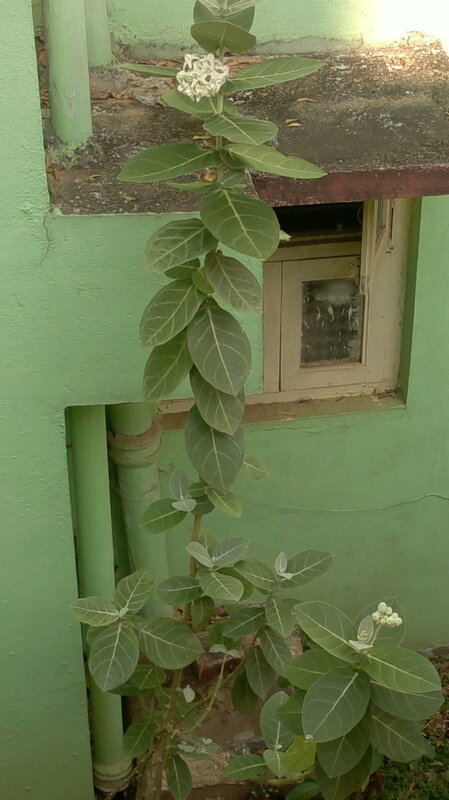 A friend who visited my farm who saw an Akk plant and cautioned me from growing it around. It’s a weed and not considered auspicious, he said and plucked couple of them along with their roots. According to botanical.com: It has long been used in India for abortive and suicidal purposes. The dried root freed from its outer cork layer is called Mudar and is very largely used as a treatment for elephantiasis and leprosy, and is efficacious in cases of chronic eczema, also for diarrhoea and dysentery. It’s unlikely you’ll come across an Akk plant in your neighbourhood. At least not in city gardens or parks. But during my recent road trip to Nimbal from Dharwad I came across Akks as tall as 10ft. growing in the courtyard of several houses. Ever since I came to know that leaves of Akk are one of the main ingredients of an organic pesticide I have let them grow, hoping to use them some day. Can someone tell me: why people grow Akk in their courtyards knowing well that it’s poisonous? a lethal sap flows through the canal system of milkweed plants. But for the Monarch variety of butterfly all the others shun it. Monarch ans its relatives have adapted by taking these chemicals and using it become distasteful to predators. I’m told Akk is favourite of Lord Shiva and have seen its leaves made into a garland offered to the lingam during Mahashivratri. That couldn’t be the reason of having an Akk in the courtyard! What do you say? It’s about two weeks now since I’ve been using EM at my farm having learnt about its efficacy from users. It’s too early to know the difference it has made. I thought why not share the info about EM with you what this is. Discovered by Dr Higa of Ryukyus, Okinawa (Japan), EM or Effective Microorganisms is a specific group of naturally occurring beneficial microorganisms with an amazing ability to revive, restore, and preserve. Microorganisms are tiny units of life that are too small to be seen with the naked eye and they exist everywhere . Microorganisms are crucial for maintaining the ecological balance. They carry out chemical processes that make it possible for all other organisms including humans to live. These are friendly guys of the microbial worlds known as beneficial microorganisms and a not so friendly group called pathogens that are harmful and capable of producing disease, decay and pollution. Effective micro-organisms (EM) consist of common and food-grade aerobic and anaerobic micro-organisms: photosynthetic bacteria, lactobacillus, streptomyces, actinomycetes, yeast, etc. The strains of the micro-organisms are commonly available from microbe banks or from the environment. There are no genetically engineered strains that are in use. EM has been introduced in India very recently and has been in use in Tamil Nadu and Maharashtra since couple of years with excellent results. At least that’s what farmers have told. Current research indicates that EM cultures can suppress soil-borne pathogens, accelerate the decomposition of organic wastes, increase the availability of mineral nutrients and useful organic compounds to plants, enhance the activities of beneficial micro-organisms, e.g., mycorrhizae, nitrogen fixing bacteria, and reduce the need for chemical fertilisers and pesticides. EM helps to increase beneficial soil micro-organisms and suppression of harmful ones. EM is a combined culture of aerobic microorganisms (requiring oxygen to survive) and anaerobic (requires no oxygen to survive) that co-exist together to the mutual advantage of both (symbiosis). It combines with the existing microorganisms within the soil and works in tandem to build a healthy living soil. A trade mark product used to identify this particular mixture of beneficial organisms, EM is not toxic or pathogenic and is safe for humans, animals and the environment. EM has been used on many different soils and crops over a range of conditions. EM is not a substitute for other management practices. EM technology is an added dimension for optimising our best soil. Marketed by Marble Org India, EM is available in one litre and five litre packaging. Stir thoroughly. Keep the bucket in shade and leave it covered for four days. On the fifth day you will smell a sweet-smelling liquid brown in colour. This mix will make a non-toxic chemical free insect repellent. It can be used to prevent pest and disease problems in the garden. It acts by creating a barrier around the plant thereby protecting it from insects. The mix can be enhanced by including garlic, hot peppers or aloe vera. These are chopped or mashed before adding to the mix. Pour a ltr of the mix into the farm sprayer along with 14 ltrs of water. Spraying can begin from seed germination or plant establishment and before pests and diseases can be seen. Spray weekly either in the morning or after heavy rains for best results. As a foliage application apply twice a week spraying directly on to the plants ensuring through wetting. As a soil application spray once in 10 days. As a compost application apply to the compost heap to cut troublesome odours and flies as well as improving the compost process and quality. Keep reading the posts I shall keep you updated my farm is faring with EM sprays. Did you know that asafetida (hing) is used as an alternative to chemical pesticide? And I end up saying, “Jaroor?” Because the stuff he brings is pure and not diluted as the reputed brands in the market. It happens so that Kaushal’s wife is from Hathras. Every time he visits Hathras or someone comes visiting him from Hathras hing (asafetida) comes along. Hathras, now a full fledged district of Uttar Pradesh is traditionally famous for its hing and ghee. Is it true, I asked, that hing is used as a pesticide? “Arrey hing ki khali bori hazar rupaiye mein bikte hain,” he answered. Biopesticides are natural substances and organisms that help us manage pests. In what way do they differ from chemical pesticides? Chemical pesticides are discovered by people in laboratories. Biopesticides exist in nature. They cannot be patented so western corporations hate them! How long have they been around in India? Cow urine and Neem have been used in India for centuries. However, biopesticides as packaged and branded products are about two decades old. Why is there a lack of awareness about them? Farmers and tribals know biopesticides well. Awareness is low amongst city elite as they feed on capitalist propaganda. In what way are they beneficial to the soil and farming. Biopesticides are sustainable. They do not cause upheavals in ecology. The cost-effectiveness of all pesticides needs a new form of accounting. How much does the slaughter of natural fauna cost? What is our health worth? What is broad spectrum of biopesticides which addresses cash crops, fruit and vegetables. Biopesticides can be classified as entomophagous micro-organisms, ento-pathogenic fungi, predators, parasites, and herbal extracts. Biopesticides are available from licensed retail outlets. Each State Agricultural Directorate or Commissionerate maintains a list of certified outlets. I personally use Namdeo Umaji, on the eastern side of Mazagaon Station in Mumbai. Last week I was in Dharwad along with my city bred kids visiting my mother-in-law. Dharwad does strange things to me. For it was here that I was introduced to the world of farming, thanks to my father in law: Dr S N Kadapa, a plant geneticist of international repute who specialized on cotton varieties. In fact, my two daughters have a cotton variety named after them. Dr Kadapa, an affable man with a smile for everyone interacted with academicians, researchers and farmers at their own levels. Never giving the other opportunity to feel that the other was less knowledgeable than him. In fact, he took self-abnegation to a different level. I often visited his research station at Dharwad Agriculture University and marvelled at the patience, perseverance and dogged determination of plant scientists: for it takes years to develop a hybrid. By the time I has enough savings and bought a piece of agricultural land Dr Kadapa was no more. Had he been around I could have always approached him for solutions to my problems related to farming. I either approach different forums related to agriculture or check out columns in newspapers like The Hindu or Deccan Herald. In my present I dug the old issue of DH, my mother-in-law had preserved for me. In this post I am sharing the information I picked up and which could be helpful to a novice farmer. N R Chandrasekhar of Nenamanahalli in Kolar district (Karnataka) has built 50 pits which can store 900 lts of water totaling 45,000 lts. So that not a single drop of rainwater leaves the land. He says that the crop won’t be affected if it doesn’t rain for a month, with the percolated water underground taking care of the crops. Besides he has sown horse gram whose green canopy will stop evaporation. Earlier, he had grown ragi and when it rained he sowed jute. These have mulched and in the process created six to eight tonnes of leafy manure. Suraj Patil of Kamlapur in Gulbarga district of Karnataka has revived the famed red bananas which sells for Rs 100 a dozen in Bangalore and Mumbai. 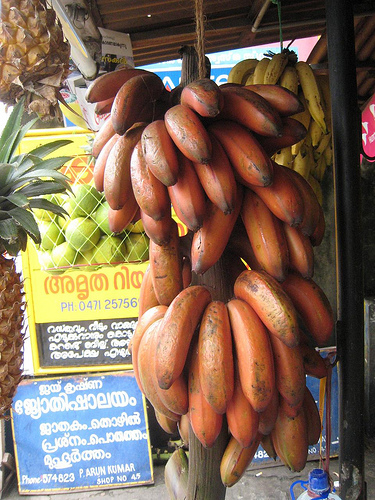 Red banana has been registered under Geographical Indication registry. Plantation starts in June to August and requires a large quantity of compost. The cost of farming is Rs 50,000 per care and the income generated is around Rs three lakh per acre. Red banana plants grow too tall and storms or heavy rain could fell the plant. Toobugere in Doddaballapur taluka in Karnataka has the country’s only Jackfruit Growers’ Association. Most jackfruit plants are planted on the borders of the plot which begins fruiting from the seventh year onwards. Eshwar Prasad of Puttur in Dakshina Kannada has grown paddy on areca peel in front of his farmhouse. He took care of the pest by spraying a mixture of garlic juice and asafoetida. Having tasted success he plans to sow a short grained variety of paddy next year. Non-Pesticide Management (NPM) provides a set of natural alternatives to chemical pesticides. The core of the NPM strategy is use of the neem tree. Neem seeds are ground into a powder that is soaked overnight in water and sprayed onto the crop. To be effective, it is necessary to spray at least every ten days. Neem does not directly kill insects on the crop. It acts as a repellent, protecting the crop from damage. The insects starve and die within a few days. Neem also suppresses the hatching of pest insects from their eggs. Neem is not only much less expensive than chemical insecticides, it also has the advantage of not killing predatory insects that provide natural control of pest insects. Neem leaves can be used to protect stored grain from damage due to insect such as weevils, and neem cake can be applied to the soil. Neem cake kills pest insects in the soil while serving as an organic fertilizer high in nitrogen. Cotton farmers in Andhra Pradesh’s Khamman District had descended into a seemingly hopeless abyss of escalating pesticide dependence and debt. Suicides were becoming common. Non-Pesticide Management was the tipping point that brought health and hope to the farmers in Punukula village. Hundreds of villages are now embarking on the same path. Planting “trap crops” (e.g., sorghum, marigold, castor, and green gum) around the edge of the field to attract pest insects away from the crop. The trap crops are checked daily. Parts of the plants with insect eggs are removed and burned. Applying a “Nuclear poly Hydral” virus extract. Pest larvae attacked by this virus are easily recognized because they are hanging upside down from leaf edges if the crop. Farmers collect 250 infected larvae, grind them into a solution, and spray the solution on the crop. The solution from 250 larvae (“250 LE”) is sufficient to kill the larvae on one acre of cotton crop. NPM has brought noticeable changes to the village environment. Insecticide containers no longer litter the village, and the village no longer smells of insecticides. Birds have returned, and so have insects that prey on cotton pests. The natural control that birds and predatory insects provide has allowed the farmers to reduce the intensity of their NPM activities. Some farmers do not need to spray neem or chili-garlic at all. The farmers have become “citizen scientists” who can monitor pest insect populations in their fields and adjust their use of NPM methods to changing conditions. Health problems due to insecticides have disappeared. Before NPM, there were dozens of cases of acute pesticide poisoning every year. Now there are none. There have been substantial improvements in farmer income. Farmers are substituting labor inputs for cash inputs when they use NPM and composting. Few weeks back I had been to Pabal valley in Pen taluka of Maharashtra. I was visiting the place after nearly two decades to do a story on micro banking. I was in the mid eighties that I had done a story for The Indian Express on how during the monsoon months seven villages of Pabal were cut off from the outside world due to the swollen Nigde river. Villagers were unable to cross the river due to lack of a bridge. In fact, most villagers dropped out of school after seventh standard because they had to cross the river to attend school for further studies. The story was published in all the edition of The Indian Express caught the attention of Prime Ministers Office. Mrs Indira Gandhi was the PM then. Arun Shivkar who ran a NGO for the adivasis had brought my attention to Pabal. Shivkar took me to the fields tended by the adivasis who grew cauliflower, water melon, brinjal etc. Interacting with them I came across the following recipes for making organic fertilizer and pesticide. Mix them well in clay matka and close the mouth of the pot with a piece of cloth. Keep the pot in a shaded area. After every three days open the lid for airing and again keep it closed. The mixture is ready after a week. Spread leaves, branches and sprinkle the liquid and overturn the compost. With very week the heap will start reducing. After 90 days the compost is ready for the fields. Soak the garlic in kerosene oil for day. Mix all these in a mixer. Pour lukewarm water and sieve it. It’s ready for use.For every 100ml mix it with 5lts of water and spray.